In the article above, Neil Adams contends that Teddy Riner's opponents fall time and time again by focusing too much on the big overhand grip and not the initial sleeve grip that throws them off balance to begin with. 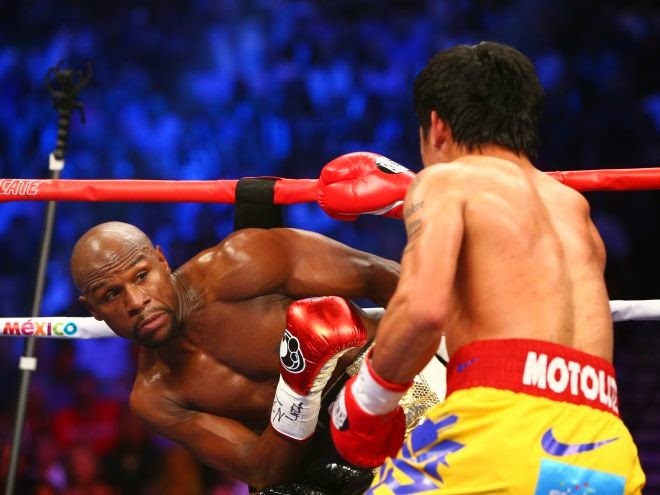 Of the many factors that led to Pacquiao's loss and inability to hit Mayweather yesterday (outside of the possible right rotator cuff injury), I will explain how Pac-Man's inability to use the advantage of his Southpaw stance against the main weakness in Mayweather's Left-Forward Philly Shell led to Money's win, and how it applies to both boxing and judo as martial arts. Pacquiao's Southpaw stance is considered to be one of the best examples of a Southpaw volume puncher - the southpaw stance allows for quick counters against feeler jabs and Pac-Man's slightly squared up resting stance allows for multiple punches to come in rapid succession. Pacquiao's Southpaw stance makes setting up combinations and counters easier when stepping outside of the lead leg and giving the user's right jab a leverage advantage against the left jab and makes the lead hook against an traditional opponent's defenses much more effective. The Philly Shell was described to me as 'Advanced Hood Boxing' - a style specifically designed to frustrate and counter sluggers and aggression. It protects the body with the lead hand while the back hand is there to swat away punches to the head, and the stance itself allows for the body to lean to all directions very smoothly, giving the user the ability to roll punches off smoothly and punish with the back power hand immediately afterwards while keeping the center of gravity over his base. After frustrating opponents by easily rolling their feeler jabs off with his upper arm, Mayweather baits the combinations by leaning forward then being ready to pivot his back foot out of the way, Mayweather tricks opponents into starting their combinations at a distance further than their opponent generally chooses to start their attack from, making their follow-up power punch hit nothing but air by pivoting or bob/weaving. Pacquiao played right into this and got frustrated, often ending up over-committing and throwing his weight too forward instead of keeping his center of gravity over his base. The main flaw of Philly Shell comes directly from how it draws its advantages - it's an illusion with a side-heavy advantage. If you look at any striking style, the power of the strike doesn't come from the arm, it's a chain reaction that starts at the feet, The traditional punching stances have their feet pointed at the opponent and hips squared up to allow for follow through and quick returning of the arms for follow up shots. The Philly Shell turns this against the opponent by having those shots be aimed at the wrong point/distance by using a lot of upper body motion + pivoting off the lead leg and uses the opening created by those misses to attack. The flaw is exposed in the body mechanics - to move the upper body around so much, the base of the body/legs must remain relatively solid and stationary, and to pivot away from attacks toward the back so easily, the feet must be pointed away from the opponent. This means the mobility of the Philly Shell is an illusion - when rocking in and out, the opponent himself isn't moving any closer or further from you, it just seems that way, and his range of mobility is actually limited. Pacquiao could have taken advantage of this with a combination of two adjustments - stepping out more towards his right (which he generally does) + closing the distance. This would have left Pacquiao with no longer being tricked by the upper body, a leverage advantage with his lead jab over Mayweather's (If only Pac was 2+ inches taller and arms longer), opening up the lead hook to the body/head, and making the left straight (which Pacquiao loves and landed a few times during the bout) easier to land the second the lead shot gets blocked/evaded. To describe the effect of breaking down the technique of having an opponent trick your senses of perception and distance, check out this somewhat cheesy clip of 90's Japanese anime Ruroni Kenshin where the swordsman goes up against a ninja kenpo practitioner. What can Judoka learn from this? When you are frustrated with the grip/stance of your opponent controlling you/preventing you from attacking, remember that every non-neutral stance has its strengths and weaknesses. High collar grip by a taller opponent jerking you around? Drop your elevation quickly and use his grip to set up a throw. Opponent stiff-arming you and preventing you from closing the distance? Use his arms like a lever and rotate around his body rather than towards it. Opponent dropping his hips and creating a solid base (Jigotai) to prevent you from throwing him? 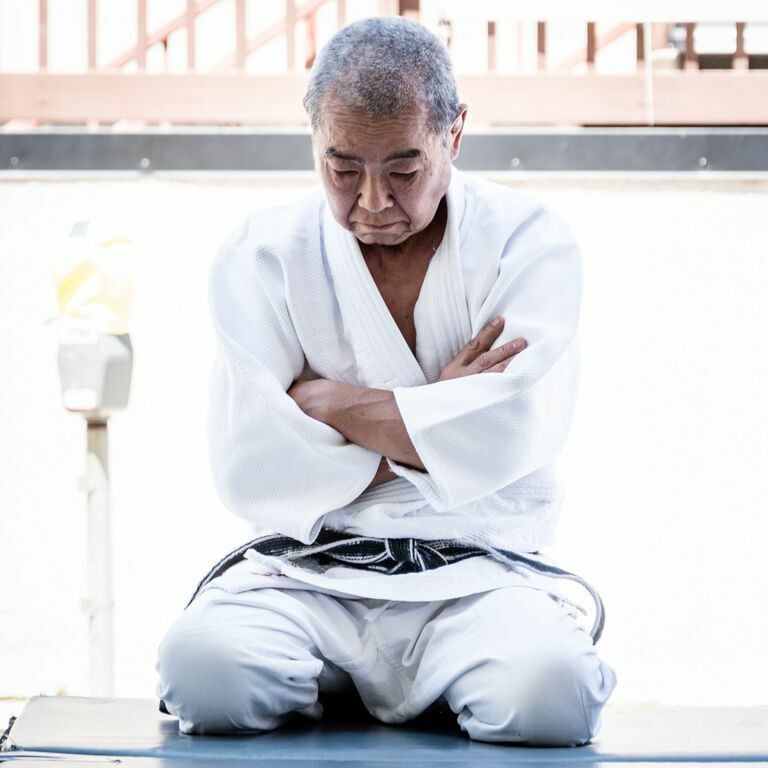 Take advantage of his lack of leg mobility and force him to pivot or attack his legs with sweeps/ashi-waza. Remember that all applied martial arts is physics and all non-applied martial arts is psychology. Ronda Rousey and BJ Penn sparring at AOJ from Roots of Fight on Vimeo. BJ "The Prodigy" Penn from Roots of Fight on Vimeo.